31 Rue Cambon, the apartment's namesake fragrance from the recent Les Exclusifs collection, is likewise ornate, or at least, more so than the rest of the collection*. Jacques Polge, the in-house perfumer at Chanel, described it as an oakmoss-free chypre with a "dry, musky, nutty scent"; the notes are said to include bergamot, iris, jasmine, patchouli and labdanum. 31 Rue Cambon is, in my humble opinion, the best of the collection. It starts with bright, rich citrus and leads into a stylised blend of florals over a chypre base. Like any modern chypre, it is oakmoss free, oakmoss now being verboten in any serious concentrations, but unlike most modern chypres (I am still puzzling over Miss Dior Cherie), it smells like a chypre. It is, as advertised, very dry, and has a musty-earthy quality that evokes oakmoss without exactly smelling like it. The musty-earthiness recalls any number of vintage fragrances, still, 31 Rue Cambon has a decidedly up-to-date aura, very chic and spare, with a satisfying depth that doesn't feel heavy or old-fashioned. The peppery iris in the base is lovely (and even more so if you layer it with 28 La Pausa) and the sillage and lasting power are both good for an Eau de Toilette. If you only have the time and energy to try one of the set, this is the one I'd recommend. So what of the Les Exclusifs as a whole? Well, first off, they are well done, each and every one* of them. The materials are first rate, they are all wearable without being dull, and they are "worthy of the name of Chanel", whatever that means. Even the relatively simple Eau de Cologne is lovely, although unless you need your Eau de Cologne to say "Chanel" on the label, I'm not sure you couldn't do as well for less. Victoria noted at Bois de Jasmin that "I cannot help but think of these fragrances as accords rather than as grand French perfumes..." and that is true enough, I suppose, but that is the modern style, and as the style happens to suit my own preferences, I'm not likely to complain. But do they, as Luca Turin asserts, "permanently change the landscape of perfumery"? Well, I don't know that I'd go that far, although I can understand his sentiments given how awful things could have turned out: the day Chanel launches six vapid niche fragrances at once, we might all just as well put away our toys and go home. Still, I can't help but wish that the collection as a whole was more daring. As much as I'd dearly love to have a vat of of 28 La Pausa (and it would have to be a vat, as it fades quickly), 31 Rue Cambon is the only one that struck me immediately as new and unusual; it is the only one I'd be likely to recognize if it passed me on the street, as it were. Given that Chanel is rather late to the niche game, Hermes and Armani (and in a lesser way, Prada) already having entered the arena, and given how little time we have these days to get to know the latest thing before the next latest thing is released, I'm not sure that one really unusual entry out of six is enough. In fact, I'm not sure these multi-scent releases are such a good idea in today's landscape at all, although it is easy to see why they are attractive to the perfume houses. A little poll, for anyone who has time to comment: did the collection live up to your expectations? And if you could have one set, absolutely free, which would you choose: the Chanels, the Hermessences, or the Armani Prives? See also: a review of Bel Respiro. 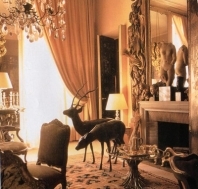 Note: image of Coco Chanel's apartment at 31 Rue Cambon via decorare. * Please note that I'm not including Coromandel. It isn't likely that I'd enjoy "a spirited oriental with amber and dry notes", and I most vehemently didn't, so I'm not including it in anything. Very true! 31 rue Cambon is the most striking of the set. Then again, I do not see Chanel as an avant-garde house (No 5 notwithstanding), but rather a house that never fails to produce high-quality, beautiful fragrances. There is such a lack of them in the current marketplace, so I was not disappointed. On the contrary! N, I think those are my answers too. V, apologies if I used you as a “straw man” — didn't mean to, but the statement has stuck in my head since I read it. But you didn't answer the poll, which of the sets would you take? Yes, I am thrilled with les Exclusifs! I'd choose them over the Hermessences and Armani Prives (though Eau de Jade is a big personal favorite.) I'm not yet sure which I'll end up buying, but I really like No. 18, Bel Respiro, Coromandel (it starts out on a Vol de Nuit vein and then evolves into something new and modern), 31 rue Cambon and the Eau de Cologne, too. I'm just in the beginning stages of sampling them, but I think if it were November, with the prospect of winter ahead, I'd have already ordered Coromandel. I like la Pausa, but it completely disappears, completely, without a trace, in about 10 minutes. Funnily enough, I thought 31 was the least unusual, except for the Eau de C (which smells very Parfums de Nicolai!). 31 is rich, luxurious, womanly and wonderful, but very much in the tradition of classic French perfumes, to me. I'd actually be happy to have them all. I'll probably get the EdC (or Bel Respiro) for summer and keep enjoying my little 15ml bottles of the others until fall. Thank you for this post/poll. I'll be so interested to see the results. I sort of wish I hadn't read Luca's piece about them before testing them. It would have been exceedingly hard to live up to that sort of press. I also am not an edt person. I really prefer parfum concentrations in almost everything since I don't like to spray and I'm a base notes sl*t. OK, that said, the more I tested them, the more I liked them. All of them. I loved 31 (my fav by far), Coromandel and the EdC immediately. The rest have followed. But am I as entranced w/ them as Luca? No, not quite. And I'd choose the Hemessences hands down, followed by the Prives. L, so nice to see you! I like them all except Coromandel (which just isn't my style) but it sounds like you like them considerably more than I do. I do think 31 RC is the best, but the only one that I am really dying to own is La Pausa, and yet, you're right — it doesn't last. Oh, I have to agree — in fact, I wish I'd read *nothing*. After all the advance press, I was sort of sick of the subject before I even smelled them at all. And I'm with you on the Hermessences! I joined a group of perfume friends at the Chanel Boutique in South Coast Plaza this past Saturday. Although I had spray decants of all six of Les Exclusifs, I really wanted to test them out of their original bottles. My favorites, up to that point, were No. 18, Coromandel (my husband liked that one) and 31 Rue Cambon. After spraying No. 18 and 31 Rue Cambon out of the bottle (I skipped Coromandel, because it's lovely but not terribly original), I was surprised to discover that the latter had the better lasting power and was really quite lovely. That said, I am still debating whether or not to purchase it. I wish 31 Rue Cambon came in parfum, as the original four are so much more beautiful in the parfum as opposed to the EdT. Plus, 31 Rue Cambon smells very similar to MDCI's FK #3 (Enlevement Au Serail), which I love and will purchase when it arrives at luckyscent.com. Has anyone noticed this similarity? Anyway, of the niches from the fashion houses, I think Hermes wins. BUT if Chanel releases these in parfum, the line may ultimately be the best in my book. Thank you for your thoughtful analysis, darling. Oops, I missed it. I prefer Les Exclusifs hands down. The only fragrance I dislike out of 6 is Coromandel. I love La Pausa and 31, Rue Cambon and like very much the rest. Plus, if I were to include a practical consideration, they seem to be a better value for the money (Hermessence fragrances also do not last as well, but then again for $175, you get only 100ml; short-lived Armani Prive are 50ml for $185). I agree with Victoria's comment – they're very much in line with what Chanel is. Les Exclusifs lived up to my expectations. 31 Rue Cambon is the most Chanel-like and the most unique, like you said. I also get a slight animalic note in the beginning. On my skin, it's just such a warm, soft iris. My next fave is Coromandel, then Bel Respiro. I also very much enjoyed Cuir de Russie remake. R, I just read an account of your shopping expedition on MUA, and still cracking up over the “FDA regulations”. Wish I could have joined you, although it sounds like your treatment at Chanel was less than spectacular! You probably already know that it is rumored they'll come out in parfum, but whether it is true or not, I have no idea. I would LOVE to have La Pausa in parfum. And have only tried 2 of the MDCIs so far (and not that one), now you've inspired me to get on the ball and try the rest. And I have yet to try the 4 remakes, Ina…must do that soon, although I think I'd rather have Bois des Iles in parfum. 31 Rue Cambon *is* sort of animalic — Marina said leather, I think, and it does smell leathery in a very soft way, although I notice it more at the end than at the beginning. After two testings and considerable reflection, 31 Rue Cambon is my clear-and-away favourite. I wish it had double the presence, though the lasting power is actually considerable on me. Coromondel is the obvious winner for sillage and the one that seems to immediately grab most people – it was my husbands favourite and I love the honeyed aspect of the heart and base notes. Eventually, the sweetness started to wear on me a little, though. (Still, a amber/patch I can wear for any length of time is an achievement.) I love the drydown of Bel Respiro and the very fleeting heart of No. 18 – particularly the former – but I have trouble with the openings. So, no, I was not really disappointed, and I would take this collection over Hermessence and the Armani Prives, because: a) the other collections don't have anything I've tried that I love as much as the Cambon, and b) I could wear any of the Chanels at some point, and I can't say the same for the other two lines. But – and I'm sure you agree – I'd take 6 free Frederic Malles instead any day. I've now been three times to Chanel to sniff and as I don't connect with Elena's work, I would have to say I'd gladly find a home for all of the Exclusifs if some dark-eye prince wanted to offer me a stupendous birthday gift… Like Elle, I kind of wish that I hadn't read Luca Turin's review which raised our expectations way too high. And like Victoria, I think that Chanel is basically a classic house, so I wasn't really thinking niche and daring… Vior de Russie and Bois des Iles are still on top of my list, but 31 rue Cambon is a definite contender, and Bel Respiro enchants me. I think once the excitement dies down we'll learn to appreciate, in a more considered way, the uncluttered, dégagé and quite modern elegance of this line. That's '”Cuir de Russie” of course… SO was reading over my shoulder (and no, he's not a dark-eyed prince) and perturbed me! Giggling. Coromandel was probably my favorite, with RC second and Bel Respiro a surprising (to me anyway) third. I can't help but think that *all* of these could/would have dazzled in an EDP or parfum strength, and if I fault Chanel for anything, it's not giving us that option. I STILL think it's peculiar. So I'm going to cheat on your poll. As it stands today: yes, and I'd take the Prives. If they released all of these (except, I guess, the cologne) in a stronger concentration: Les Exclusifs. Hmm, my initial reaction was “bof.” None of them really struck me. I suppose if pressed I would choose No. 18, because of the dry martini/gin smell it has on me, but I'd much rather have the hermessences or the prive. Yep, would take the FMs, hands down! LOL — and did he mind reading that he is not a dark eyed prince? And I would find a home for all of them except Coromandel, so I'm not meaning to knock the line. I do like it very much, I just don't quite adore it, or at least, not yet. You may be right that it will come later. The collection met and exceeded my expectations. Despite the raves of Dr. Turin, I expected something much less wonderful, simply because of the sheer number of the releases, all launched at once. I think 31 and 18 are the most unique of the 6, but I would wear and would love to own them all. Armani Prive scents leave me absolutely cold. If ever there existed a line that was ridiculously overpriced, that's AP. Of the 6 Hermessences I only like 2, perhaps 3. So yes, I would choose Chanel's Excluisfs above all others. I would even chose them above Guerlain's Art et la Matiere series, of which I only like one single scent. Tara, I totally get your “bof” but strangely, it's the very vagueness — for want of a better word — of these that entice me. As though they left a lot of room to play. Maybe I just need a respite from the fragrances that wear you, or of my beloved vintage extraits. But it strikes me as quite modern in a not-trying-too-hard kind of way. At least they're not trying to be *young*, thank the gods. I think much of our perplexity (love, love not, just bof) has to do with the concentrations and I am, as we all are I think, looking forward to the sort-of-alluded-to issue of some extraits. Nah, he's a blue-eyed sweetie with a bad cold, but he'd get me Cuir de Russie in a wink if he had the euros… By the way, here in Paris they're at 180 euros a bottle, whereas in the States, at 175 dollars a shot that's like 134 euros… Even with the taxes, they're way cheaper for you guys, which is just no fair and impossible to fathom. Waaaaaaaaah! Very interesting observations regarding Les Exclusifs. I wholeheartedly agree with you about 31 Rue Cambon and have no doubt it will be the most popular. It also, to me, is the most Chanel like – adhering to the formulas and combinations that have made the house successful. Unfortunately dry chypres do not agree with my skin or nose so I won't be wearing it. I did not care for the Armani scents or their price point. Not having yet tried the Hermessences I can't comment on those. I agree with Marina that Chanel knows their clientele quite well and avoided the “daring” genre on purpose. Of them, I would gladly purchase Coromandel, Bel Respiro and No. 18, the latter two in EDP or parfum formulations only. They just disappear too quickly on my skin! And I know others say the same. Have a great day and thanks for your thoughts! 180 euros, seriously? I can't imagine why. Actually, not that $175 is cheap, but I would have expected them to cost far more — something closer to the Hermessences or the Armani Prives. Tom Ford's Private Blend will be $165 for 50 ml (a quarter the size of the Chanels), and hard to see how they can be better. I would say the same of Bel Respiro — it ought to be light, but guessing nobody will agree with me. I also don't mind Rue Cambon in EdT. The rest ought to be in a heavier concentration, agreed. M, you are so right…I do *not* want to see Secretions Magnifiques from Chanel, and I don't even expect anything outrageous. Just maybe something a little tiny bit more unusual? Otherwise, what is the point? I think 18 is unique too, but as as much as I like Bel Respiro, well, it isn't unusual, and I would say the same of La Pausa. Guerlain's Art et la Matiere, I don't know why, but I put in another category altogether, Guerlain being a perfume house and not a designer/lifestyle brand, but perhaps that is a false divide. Well I like all the scents except for Coromandel, and I REALLY like 31 Rue Cambon (reader, I bought it), but no, the set didn't live up to my expectations. And I guess, if I were forced to choose, I would take the Hermescences, which I think are more unusual on the whole. They did not live up to my expectations, I found them all pretty light and I could not believe how quickly they collapse into the base. As if there are no mid notes at all. If you look at the entire collection most people already own their favorites – one or two of the original four. I could dig that giant Cologne bottle though, it's the size of a factice! I'll take a Prive collection please! And being a boy, I'd take the Hermessences. While they didn't live up to the hype (what could have?? ), they were certainly impressive. Especially considering that was 6 newbies at once. You're right about the Bel Respiro. And I'm happy to have any of them in their current forms… still think 31, 28, 18, Coromandel would probably be amazing in parfum. Ouch, that is nearly 240 USD. What a shame. LOL — I'll take the giant EdC bottle too! It really is a nice Cologne. LOL — Coromandel in parfum would literally kill me. I could barely get the EdT washed off my skin — honestly, it lasted 24 hours *after* a hot shower. Well, that's Robin's First Rule of Scrubbers! I find myself muttering, go AWAY already!!!! You know, it's been bugging me that these scents were supposed to be a tribute to the life and lifestyle of one of the handful of pivotal figures in what we now think of as modern fashion (Poiret, Schiapparelli, Chanel, Vionnet and Dior), most of whom were pretty wild characters, and there is not a hint of that iconoclastic visionary woman in these scents. They definitely have the sense of having been created with classic french perfuming techniques, they somehow have that Chanel Touch (I'm not a huge fan at this point in my life, I was long ago), but not the touch of the woman who said something like “At 30 you have the face nature gave you, at 40 you have the face you have made, and at 50 you have the face you deserve.” BTW, 31 is my fave, and I might take these over the others you mention, as modern icons, and to share………….. I would pick the Hermes line. On second thought, give me Frederic Malle any day over Hermes, Chanel or Armani. My fave of Les Exclusifs was 31 rue Cambon. But then, I'm a chypre lover. The “FDA regulations” excuse made my mouth drop open. The SA thought that throwing around “FDA” would intimidate me. Instead, she exposed her ignorance. I felt a little let down, as a result of Turin over inflating my expectations. Of the set, I absolutely hated 18, Coromandel made me cry out in horror, EdC was OK, Bel Respiro started lovely but did not develop well on me, and I wouldn't say no to bottles of 31 or La Pausa if someone else was paying but not if I were. As for the poll, I've only sniffed the Prives in the bottle and didn't like any of them, whereas I adore 2 and quite like a further one of the Hermessences so I guess they win. As a matter of interest Robin, are the classic reissues now only available in the 200ml party packs or can we still get 100ml classic bottles? Interesting way of looking at it, although the flip side, I suppose, is that Chanel has done a better job than the others you mention at preserving their image (and, for that matter, staying in business), and perhaps that is the justification for sticking to relatively “safe” fragrances? As to your last question, honestly, I don't know — if I read the answer somewhere, it got lost in all the other stuff. The “Rue Cambon collection” was recently removed from the Chanel website, so my guess is that they are goners except in the new form? They do, however, list a phone number for more info for the RCs (1.800.550.0005) so perhaps there are still bottles to be had. Yes, that's so true, but if you are going to release 6 scents at once, it seems natural to have a kind of wardrobe, including something very out of the ordinary — although perhaps the Coromandel (which sounded as if I'd love it, is really frightful on me, I just resniffed it after I read your entry this morning) might be their stab at something unusual ? Why do 6 safe scents at once (yawn). And if Frederic Malle were a choice (I'm a fan even though I don't really want to wear them) that would be mine, or the Guerlains mentioned elsewhere, as they are all so much more interesting than the Chanels. Is the Coromandel unusual though? To me it's a conventional stab at the Angel/Prada buying market and in not so different a vein to Chance and Coco Mad. The unusual one in my view is the Bel Respiro, with perhaps 31 coming up behind in that it's unusual for a modern release. Completely agree on the Frederic Malles — they would trump these in a heartbeat! You've discovered my guilty secret — I stay as far away from commercial perfumes as possible — I just kind of sort of know what you mean when you mention those scents, and perhaps that's why I almost hated Coromandel, and you too! It did stand out to me against the others, perhaps for blatant commercial pandering, rather than edginess! Their formulations do all smack of the classical, not too modern, as you say! It does make me wish even more they'd come up with one scent that was more challenging a la FM. They must have had some guidelines! I do wonder what kind of commercial success these kinds of scents could possibly have, with the exclusive releases and all ? It could be just to feed the Chanel legend, and they do a masterful job! Thanks for the wonderful review & poll! I really enjoy reading your sincere opinions and insights on this collection: couldn't agree with you more about this being a relatively safe collection. I would pick 31 Rue Cambon as my favorite, and I do think this fragrance lives up to the tradition of the house. Honestly, I don't care about the $/mL issue: if it is worth the price, then so be it. I have Osmanthe Yunnan and it smells great on me. I love how Ellena made osmanthus into an unisex cologne and I get compliments from the ladies EVERYTIME I wear it. It's always long-lasting on my skin (about 4-5 hours! ), so I feel very lucky that I have found my signature. As for the poll…tough choice…I would pick Hermes, simply because there are more options for me. I guess I could use Bel Respiro and/or Cuir de Russie (I am happy with my Eau de Imperiale de Guerlain, thank you…), but then I have comparable scents already. I don't know the Armani collection enough to rate it, so I won't bother. Thanks for the kind words! I suppose I care about the $/ml issue more than you do. There are so many wonderful niche scents on the market today that obviously jacked up luxury prices annoy me, especially if the scents smell like they were cobbled together in a matter of days (and that isn't meant as a comment on the Chanels, which don't strike me as either ridiculously priced or badly done). Osmanthe Yunnan is a wonderful scent, and still hoping we'll get another Hermessence later this year. So, I'm a little behind but I just brought a bottle home of the Cuir de Russie. Why can't they make these smaller? Charge the same, just give me less. I WILL NEVER use all of this. And, I really do love it. I proudly displayed it on my vanity and sure enough all of my other parfum looks out of place next to it. So, I cleared everything off and only this remains. And, it makes a statement. She gave me a miniature bottle of 31and so maybe I will get it later…but then how will I ever use two of these bottles. It is just too much! I actually got a small sample of 31 Rue Cambon (4 mL) for free from the Canadian boutique a few months ago, although officially the Canadian boutiques are not suppose to do that. (And a little goes a long way with that one.) If you really have your heart set on it try eBay for the samples or you might try asking someone to split a full purchase with you (see previous entries of this blog). Good luck! AspiringPerfumer, that's a shame! I do wish they'd do smaller bottles. I really need to try this one (31) and I will tomorrow en route home from work. I know the sales assistants in the Chanel boutique will eye my suspiciously as I once again come in sniffing. I tried no.22 yesterday and surprisingly really liked it. it did smell somewhat powdery but there was something so nice about it and i managed to get a sample of it I'll post tomorrow when i've tried 31 rue cambon with what i think. I should think the SAs would be happy to have someone come back to smell — it means you're interested! lol – i just meant that the sa's would be wondering how many days in a row am i going to go in sniffing? I tried this today and it was, well, ok. Didn't rock my boat at all and i was really expecting it to knock me over and demand that i buy it. It was nice but almost headaching inducing. It seems to have got so many rave reviews that i thought it would be extraordinary but alas it wasn't on me – maybe on the right person? Just a note — when you comment, you don't see your posted comment right away unless you refresh the page. If you go back and hit post a 2nd time, you've posted 2 copies of the same comment and then I go and delete 1 of them. Oops, sorry about that. Didn't realise I was double posting. Thanks for letting me know. Hopefully this hasn't double posted! It's ok — this last one only posted once, and so did the next one you left (on another article). OK thanks – maybe i've finally cracked how to post without double posting! The collection *is* quite well-done, but really rather tame, especially given the EDT concentration. I thought the Eau de Cologne was nice, but the sillage and lasting power is absolutely dismal. The SA mentioned that it was the only Les Exclusifs fragrance that is available in a 400ml size option (everything else comes only in 200ml), in addition to the 200ml, and it's not hard to see why. Gimme the Hermessences any day. I'll take the Hermessences too, although I do think the Chanel collection is nice…and love the new(er) Sycomore. Hopefully we’ll get to it some day! Oh my gosh! This is beautiful. And it is mine (moowahhahaha!) I have fallen in love – again. I am so glad perfumes are neither men nor have feelings. I love so many of them! This scent is a beautiful end Summer *sliding* (ok, more like lurching back and forth from high humidity to icy chill and back again) into Fall fragrance for me. Our weather is neither gentle nor graceful by any stretch of the immagination. But the fragrance is so gentle and beautiful. I cannot describe the pleasure of this scent. I am just blissfully breathing with half closed eyes, a bemused expression on my face, and completely at a loss for words. Weather? What weather? (sigh). Work? yeah, ok work….Oh WORK! I’m late! Oh, sounds like you’ve fallen in love, how nice!! Lol! Yes, deeply and irrevocably. Just don’t expect faithfully. Scratch that……I promise to faithfully love, and revel in, all my perfume loves equally! There! Now none of them have anything to complain about. Oh Robin! Thank you SO MUCH for seeing my four year late post and giving me hope. I will definitely check that site…probably for many things, but definitely for the 31 first. Thank you, THANK YOU, neighbor. I would eventually caved but with a split (hopefully) that leaves me money to buy something else…probably a Tauer. De nada, and good luck!